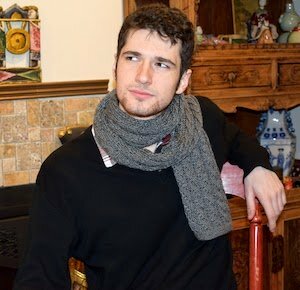 My scarf is about 7 inches wide. You can add multiple of 7 sts to the cast on make it wider. Then follow the same pattern. 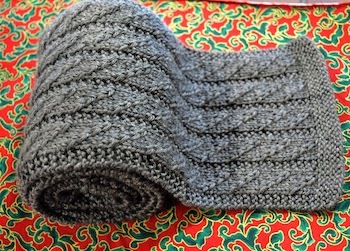 Knit every row for 1 inch ending with right side row. Purl one row on the wrong side. Row 1: k3, *(C2B, k3) k2; rep from* to last st, k1. Row 2 and alternate rows: k3, *p5, k2; rep from* to last st, k1. Row 3: k3, *(k1, C2B, K2) k2; rep from * to last st k1. Row: 5: K3, *(k2, C2B, k1) k2; rep from * to last st, k1. Row 7: K3, *(k3, C2B ) k2; rep from * to last st, k1. Rep row 1 to 8 until reaching the length you want ending with row 8. Then do garter stitch border for an inch. Bind off and block piece. C2B = Cross 2 Back, do this by knit into back loop of the second st on left needle, don’t slip it off yet. Knit the first st from left needle and slip both sts off at the same time. Here is a pattern I wrote out this morning if anyone want to start making it along with me. If you find it hard to make C2B then watch video below.